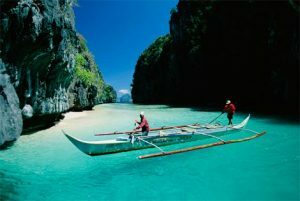 One of Asia’s less ventured destinations is the Philippines. Most people who travel there are experienced backpackers or people who take “time out” to travel and therefore have a longer time to explore. Manila, Philippines’ colourful capital, is where most people begin their tour, although it is very noisy and energetic and some travellers find this overwhelming and a day or two may well be long enough in this city. Intramuros is the oldest part of the city. You can have your fortune told in the streets of Quiapo and Divisoria or visit one of the city’s two huge shopping malls and if afterwards you still have energy, experience the sophisticated nightlife in Makati, The Fort, Ortigas and Malate, where you will find many wonderful restaurants, clubs and bars. You can book a day trip to some of the Philippines’ attractions from Manila such as a trip to the Taal Volcano which is one of the world’s most deadly volcanoes situated in the middle of a lake. Or maybe a relaxing day at the famous spa, The Farm, is more up your street where you can spend the day luxuriating and relaxing. You can visit the Pagsanjan Falls or explore the creepy tunnels at Corregidor. If you travel north of Manila, you will find some breathtaking scenery. The mountain towns of banaue and Batad are very popular with trekkers and those who wish to experience the old way of life. Sagada is a nearby rustic town which has an almost hippie-like vibe and is home to some wonderful limestone caves. To experience the real beauty of this country, however, you will have to be prepared to travel far and spend a lot of time queuing for buses or boats and enjoying a leisurely journey. In the far north is Vian which is a UNESCO World Heritage site and a town from the Spanish era. Near to Manila you will find Mount Pinatubo. This volcano erupted in 1991 but is now very popular for its hikes to the sulphuric lake. You could also start your Philippines tour from Cebu which is the country’s second city. Here could be your starting point for trips to the beach islands such as Bohol, Kalibo and Bantayan. Here you will find beautiful beaches and people adorned with colourful festival costumes. All the islands are easily accessible as there is an interlinked ferry system, so take your time to travel to and enjoy each one of these. Probably the most beautiful beach lays at Boracay. Here you will find a picture postcard heaven – white sands and clear blue waters. If you would like to travel off the beaten track a bit more, you may want to consider Palawan and Mindanao, although they are a little more difficult to travel to, but well worth the effort. The landscapes of El Nido and Coron are awe inspiring and you will find the world’s longest underground river in Sabang. In Coron, you can experience WWII wreck diving, in Tubbataha Reef an underwater UNESCO Heritage site and Mindanao is well known for its first class surfing. You may also like to visit Lake Sebu and meet the colourful tribes people.